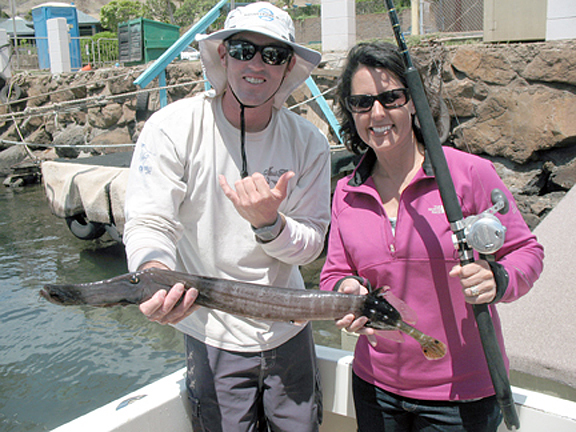 Sandy Peurach dropped her ta'ape bait into 30 fathoms of water outside Kihei and soon found herself hooked up! She winched the fish to the surface using an Avet MXL reel loaded with 15-lb test and was surprised to see she'd caught a trumpetfish. Her big catch weighed in at 2.6 lbs at Maui Sporting Goods and turned out to be a new state record. Sandy was fishing with Capt. Kelly Bryce on the MARJORIE ANN with Maui Fun Charters when she made her big catch.